That’s biáng, the most complicated Chinese character there is. It has so many strokes that Microsoft doesn’t actually allow you to type it. You can probably guess how that made me feel when I first saw it, having just started learning Chinese. Soon after, I actually started learning the characters. I had been right: For my class’ first few vocabulary tests, I had to spend an entire weekend learning just 10 or so characters. Several years on, I’m no longer afraid of Chinese characters. More importantly, it doesn’t take me two days to learn 10 of them. This is because I’ve found a way to learn (and remember) characters much more efficiently. In this guest post, I’d like to show you too how Chinese characters aren’t all that bad after all. 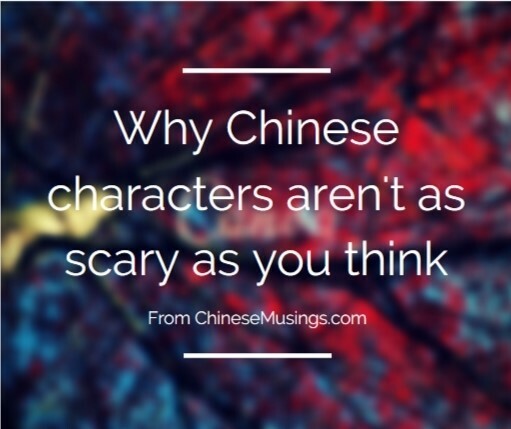 Chinese characters are not stand alone entities, unrelated to every other character. They are actually all made out of different building blocks called radicals. These building blocks are like toppings in a make-your-own-sundae place! There’s a fairly small number of toppings (chocolate sprinkles, strawberry sauce and so on). But out of these you can make any sundae you want. In the same way, there are only 214 radicals but out of these you can make almost any character. The important bit is that each radical has a meaning. As an example; 女 is the radical for woman and 子 is the radical for child. So in the same way that “strawberry sauce” refers to some flavoured pink goo, “woman radical” refers to those specific three strokes. Imagine that you want someone else to get a sundae for you. You’re very picky so it has to have exactly the right toppings. You’ll most likely describe the sundae to them as “ice cream with chocolate sprinkles and strawberry sauce”. Or something. The point is that you’ll specify the toppings. What you won’t do is list all the ingredients in the chocolate sprinkles and strawberry sauce. There’s a good reason for this: it’s much easier to remember a few toppings than all of the ingredients that went into them. The same principle applies to Chinese characters. It’s much easier to remember two or three radicals than twenty strokes which happen to make up those two or three radicals. The mistake I made, when wasting all those weekends, was that I was trying to memorize all of the ingredients rather than the few toppings. Alright, I’ve probably stretched this metaphor enough now so I’ll just spell it out for you: your life will be much easier if you remember a character based on its radicals rather than all of its strokes. As radicals have a certain meaning, you can use them to break characters down into stories! Just take a hard to learn character with a couple of radicals in it and combine their meanings into a mnemonic. The story could be made up, or you could research the real etymology behind the character. 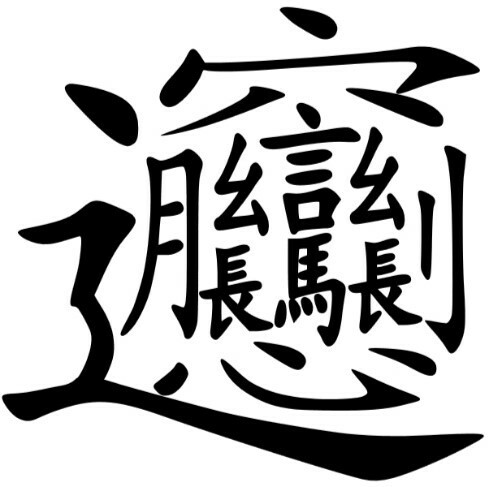 To give but one example, here’s the actual etymology of the character 看 – to watch. On the top of the character you should be able to see 手. This is the hand radical (and literally a picture of a hand). Below it is the eye radical 目. The eye radical also originates from a picture of an eye (you can see its earlier form below). So the character 看 shows someone putting their hand just over the eye. This is to keep the sun out so they can see more easily! There are 214 Chinese radicals of which only around 100 are common. This really isn’t much to learn. Beginners quickly learn how to recognize more than 100 characters, but if you really want to know Chinese you’ll need to know around 5000 characters. It’s therefore a really good move to learn 100 radicals because they’ll help you with such a huge number of characters. Back when I was slaving over those ten characters every weekend, the thing which made characters hard was the number of strokes. The thing is that most radicals don’t have many strokes. So, although you can’t remember the radicals to learn the radicals (obviously), they’re still easy to learn. Basically, radicals are easy to learn and well worth the effort for the benefits you’ll receive. I’ve shown you how radicals will change the way you learn Chinese characters. Firstly they make it easy to “chunk” the characters, just like I’ve shown you with my little “ice cream sundae” metaphor. Secondly, they allow you to make and see stories within each character. This is great not just because they’re memorable, but also because the stories are really interesting. So, I really recommend you check out some of the more common Chinese radicals. If you don’t know where to start, you could try downloading a shared deck of them on Anki. Anki is a really cool flashcard program that can also be of huge help to memorize Chinese characters and words. Now that you’ve got this new knowledge about how radicals fit together to make characters, you should definitely use this to your advantage. Unless, that is, you like spending your weekends learning the same 10 characters. Ollie blogs about learning Chinese at ChineseMusings.com. Check out the site for tips on how to learn Chinese and on the meaning of Chinese characters. Alternatively, visit ChineseMusings.com/lingholic for more content related to this post.